The activity is based on an image showing the attack on the Pequot village at Mystic, Connecticut, by English soldiers and their allies, including the Narragansett. This was one of the major battles of the Pequot War (1636-1637). 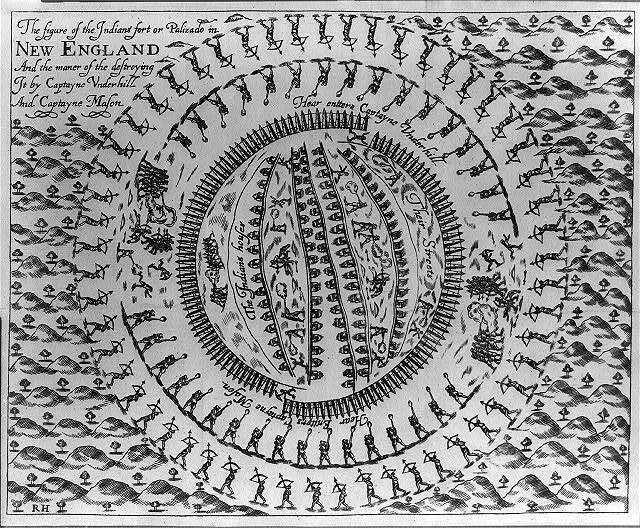 The image is included in John Underhill’s account of the Pequot War. John Underhill was second in command to John Mason, the commander of the Connecticut colonial forces during the Pequot War. This birds-eye view depicts the destruction of the village, which left over 400 Pequot men, women, and children dead. What issues or cultural practices contributed to the conflict between indigenous peoples and European colonists in Connecticut? What was the Pequot War about? How do the primary sources left behind affect our knowledge or understanding of a conflict? The figure of the Indians’ fort or palizado in New England and the manner of the destroying it by Captayne Underhill and Captayne Mason / RH, 1638 – Library of Congress, Prints and Photographs Division. You may wish to guide the looking by suggesting students “read” the image from the inside/center out, ending with the words in the upper left corner. After discussing students’ observations and guesses based on the evidence, ask students to develop their own questions based on the image. Have students discuss their questions, fine-tune them, and think about what other resources (primary or secondary) they could use to find answers. Who created this image and why? From whose perspective is it drawn? What are the clues? How might the image be different if it had been drawn from the Pequot perspective? Or the Narragansett perspective? Where could we learn more? After examination of the image and further research, have students consider the Pequot War from the perspective of a Pequot man, woman, or child; the perspective of an English soldier; or the perspective of a Narragansett man allied with the English. Presentations could take the form of a dramatic dialogue or skit, a letter written 20 years after the conflict, or an alternative illustration of the events in Mystic. Download the History and Culture eBook from the Mashantucket Pequot Museum and Research Center.